Successfully recovering from IT Band Syndrome requires a great treatment plan… and some patience. Unfortunately, It’s one of those frustrating injuries you can’t ignore or train through. You’ll need to take a break and do some extra work. But, if you follow a good rehab plan you will recover and you’ll end up a stronger, more resilient runner. In this article, I’ll walk you through my recommended treatment plan and help you get back to pain-free running. I don’t normally prescribe rest to runners. In fact, injured runners usually do much better when they continue some running. But IT Band Syndrome is different and it doesn’t tend to get better without some time off. The pain of ITB syndrome is coming from an irritated fat pad – a structure next to your knee joint that swells up when it’s irritated. And, unless you take the strain off the fat pad, the swelling isn’t going to go down. You’ll need to stop (or significantly reduce) any activity that irritates your knee. Injury time-off is valuable. Use it well and it will accelerate your recovery fast-tracking your return to running. Waste it or rush it and it will set you back, making your return an uphill battle. Let me be clear, rest is not a complete break from all exercise, just a break from running. You can maintain your cardio with cycling or swimming. And, you’ll need to do some strength training. Before I talk about exercises I want to make a brief note on pain relief. Ice, Ibuprofen and heat/ice gels are great ways to reduce inflammation and pain. Make sure you talk to your doctor and find something that gives you relief. Foam rolling is the necessary evil that will relieve tension in the muscles around your IT Band and reduce pain. Do it daily. There’s an art to foam rolling well. Check out this article explaining exactly what you need to do. One of the reasons your ITB is irritated is because you’re not strong enough in your core, hips and, knees. You’ll need to start a structured exercise program with exercises that focus on your glutes, abs, and quads. Try this free 4-week core program to get started. Building up your running volume will happen gradually over a few weeks or months. It’ll take a delicate balance of running enough to re-build fitness, but not too much to re-irritate the fat pad. The first thing you’ll need to do is find your running baseline. This is the distance you can run comfortably before your IT Band starts to hurt. It might be 50% of your previous distance, or it might be just 10%. But wherever it is for you right now is where you need to stop. At this stage, it’s important to stay at or below this limit. As you continue to recover you’ll increase it and get back to your normal training, but if you push it now you’ll only set yourself back. 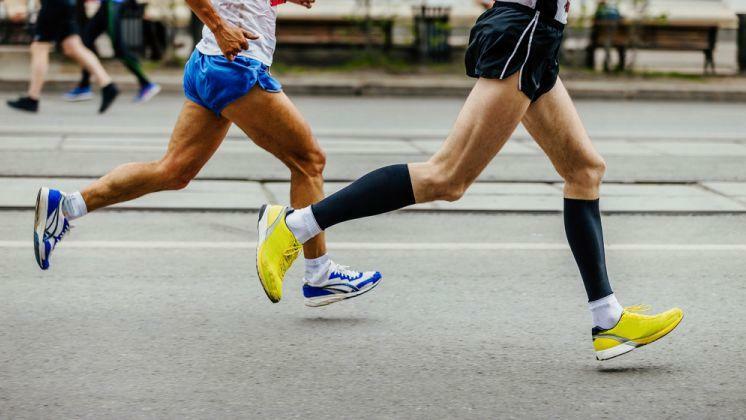 There’s no one perfect way to run and all runners have a slightly different gait but, there are probably a few small changes you can make to be a better runner. Anything you change must have one goal: making you a lighter, smoother runner. Studies consistently show that if you run light, you run pain-free. Start by checking your cadence. This is how many steps you take every minute. Taking just a few extra steps per minute will significantly reduce the strain of each landing. If you have a watch that measures cadence, see what your current number is and aim to increase it by 10 percent. If you aren’t using technology, try to be mindful of how many steps you’re taking and increase it just a little bit, or listen to a metronome as you run. Most running injuries happen when a runner over-trains or changes something in their normal routine. So, as you’re getting back into running after an injury be extra careful of not shocking your body with too many changes too quickly. Be calculated with your running schedule – increase your weekly distance by only 10% each week. Stay below your point of pain and give yourself plenty of recovery time and days off. If you notice the pain coming back, drop back to a distance that feels comfortable and focus more on strength training. Ramp up your distance again slowly after the pain has settled and you feel more confident. Your strength training should be progressing at this stage with a lot of focus on stability and control. IT Band recovery can be slow and frustrating. The key is to give yourself rest when you need it, strengthen as much as possible, and gradually rebuild running into your routine.